Dubai, UAE, June 19, 2018: After the success of the Scafograf 300, first presented in 2016 and winner of the ‘Sports Watch Prize’ at the prestigious Geneva Grand Prix d’Horlogerie, followed by last year’s GMT version, Eberhard & Co. has chosen to make the ‘Scafograf’ even more captivating and exclusive with a special limited edition, the name of which conveys all the unconventional spirit of the new model: THE BLACK SHEEP. 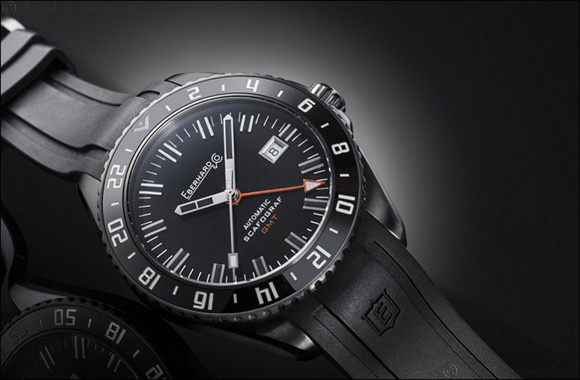 Hands: GMT hand in orange, with luminescence. Hours and minutes hands, “baton-type”, squelettes, luminescent. Central seconds hand, luminescent. Strap: integrated rubber strap, in black colour, personalised with the “E” shield, emblem of the Maison. The inside is characterised by small shields that allow good transpiration. Buckle personalised E&C. Bracelet: Chassis® steel bracelebt, DLC®-treated. Deployment clasp Déclic® (Patented) DLC®-treated.